Porto Di Moda Designer’s Haven is the online store of AVR805 Enterprises. 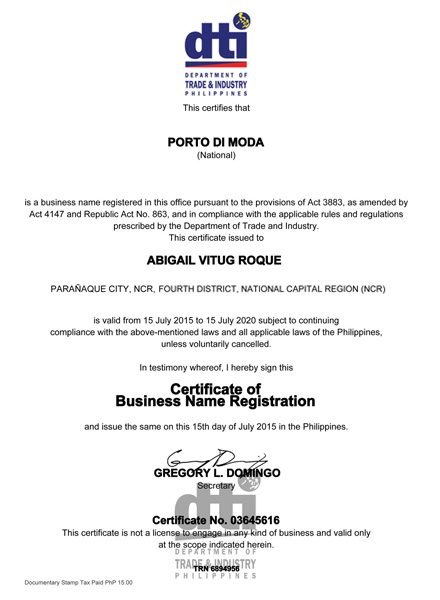 We are a DTI Registered business valid until July 15, 2020 and we have been selling designer bags, fragrances, eyewear, shoes, watches and accessories since July 2005. We only sell authentic items and all our items are guaranteed 100% AUTHENTIC or your money back. All our brand new stocks are purchased directly from authorized selling boutiques and department stores in the United States and Europe that we have made longstanding relationships with over the years. Most of our pre-owned stocks are buy backs from clients who bought the item from us brand new. All other pre-owned stocks go through a very thorough and rigid inspection for authenticity before we sell them in our store. For perfumes, all our stocks are sourced directly from the authorized distributor of that particular perfume brand here in the Philippines. Our commitment is to offer authentic designer items at very low prices, effectively bringing high-end fashion items closer to the masses. “Look good, smell good, and feel like a million — all without breaking the bank”. You are able to send payment via any of our acceptable payment methods. Item(s) purchased will be shipped to an address located in the Philippines. Since 2008, we have been actively selling items on eBay Philippines under eBay Seller ID AVR805. We are an eBay Power Seller and a Top-Rated Seller on eBay Philippines with over 8,000 positive feedbacks received translating to a feedback score of 5,000+ with 100% positive feedback.